Our charcoal grill measures 24" wide by 60" in length. Our grill tops are the best in the industry! They feature a steel core for strength and double nickel plating for durability. The charcoal grill has screw-in legs with 5" casters and black powder coat paint. The black powder coat finish is heat resistant to 1000 F and has been designed specifically for the extreme temperatures generated by charcoal. Our grill tops feature a one-piece, welded steel core for strength and double nickel plating for durability and easy cleaning. The closely spaced rods run front to back for easy spatula use and are perfect for grilling steaks, chicken, pork chops, hamburgers, hot dogs, sausage, salmon, seafood and vegetables. Our simple slide action adjustment has 3 grilling heights to accommodate a wide variety of cooking styles. Stay cool handles allow for easy height adjustment - even when the grill is hot! HIGH COOKING CAPACITY: You can feed everyone at your next party with one of these grills. 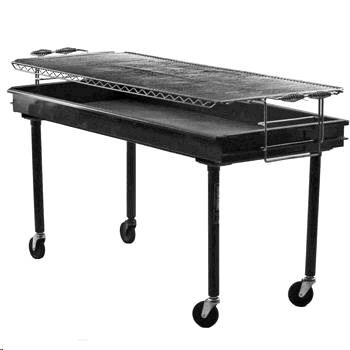 The Big John 2' x 5' charcoal grills feature 10 square feet of grilling surface and are easy to transport, easy to setup and easy to use. The grill weighs approximately 135 pounds. Rotisserie attachment also available for additional $35. * Please call us for any questions on our charcoal grill 60 inch rentals in Pipersville PA, Hatfield PA, and Bucks & Montgomery Counties in Pennsylvania.